Home Check out this opportunity on the TC Electronic Arena Reverb! If you’ve been wanting to pick up a new reverb, this might be a great opportunity. 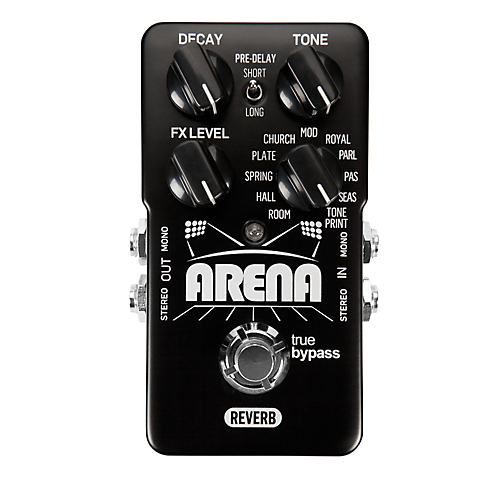 You know TC Electronic is famous for their reverbs over the years, so I wanted to bring up this killer deal on the TC Electronic Arena Reverb. The reverb uses a simple layout, Decay, FX Level, Tone, Pre-Delay short/long toggle, and Reverb Mode. You can select Room, Hall, Spring, Plate, Church, Mod, Royal, Parl, Pas, Seas or use Tone Print. Out of these modes, 4 of these are exclusive custom-made reverbs. The unit is also stereo. Alright, let’s talk about the deal! The TC Electronic Arena Reverb lists for $240, and is usually available for $150, but currently is the Stupid Deal of the Day sale at Musician’s Friend for only $99! Sweet! Those of you not familiar with the Stupid Deal of the Day, the deal only lasts for a day maximum, but it could go away if many units are sold, so if you’re interested in this reverb, you might want to jump on it.. quick like. If you have this reverb, let us know what you think by commenting below! TC Electronic Hall of Fame Reverb Sale! Crazy Deal on TC Electronic NR-1 Nova Reverb! Great Deal on the TC Electronic Transition Delay Pedal Crazy Deal on the Digitech DigiDelay! Awesome deal Dunlop Mini Fuzzfaces at Amazon! !